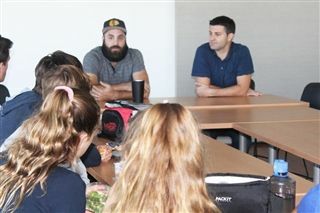 Phil Grieco and Jimmy Rosenfeld from GoPro's Sports Marketing team met with students for an informal talk about a career in their field on November 16 during lunch. They discussed the perks and challenges that come with working for an active lifestyle company and alongside high profile athletes. Mr. Grieco discussed the value of internships and finding a mentor to bounce career ideas off of. The lunchtime meeting was the second of three SPARK sessions to be held this year.